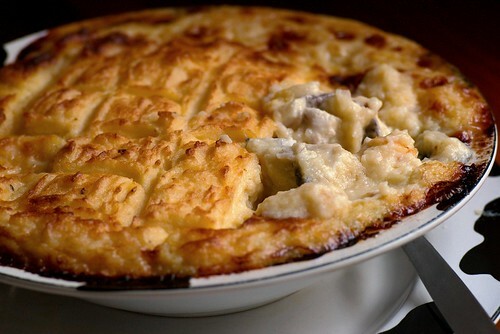 Fish pie, originally uploaded by yongtze. This recipe is adapted from Gordon Ramsay’s Posh fish pie. 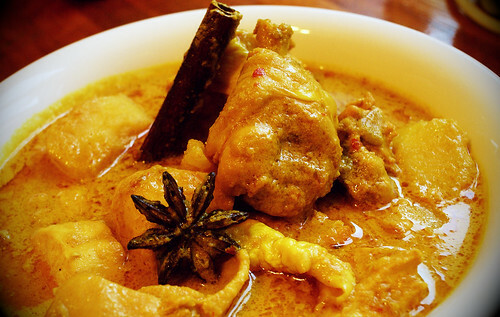 It is also a simplified one that requires less ingredients and still tastes delicious and absolutely satisfying. 1. Heat the butter in a pan and sweat the shallot until soft. Add the wine, reduce until the volume halves. Add fish stock, continue to boil until reduced by half. 2. Pour in the cream and boil until reduced to a sauce like consistency. Strain through a sieve, discarding the shallot. Stir in the mustard, check for seasoning then leave to cool. 3. Meanwhile preheat the over to 180°C. Cut the fish into 3cm chunks. Poach the fish in enough water to cover, with a squeeze of lemon juice and some dry thyme. Carefully not to bring the liquid to a boil, poach the fish until slightly undercooked. Remove the fish from the poaching liquid and place the fish into an ovenproof baking dish. Pour over the sauce. 4. For the mash topping: peel and quarter the potatoes and cook them in salted water until tender. And mash with a little milk and butter until smooth. Season with salt and pepper. Beat in the egg yolk and mix properly. Spoon the mash over the fish and sauce. 5. Bake the pie for about 20 minutes until bubbling and golden brown on top. Serve immediately. I also give a simple fish stock recipe here which I use for the fish pie because I don’t want to pay for fish stock where I can make it at home simply. I bought a whole fish and fillet the fish myself so I was left with some fish bones and head to make the stock. 1. Heat some oil in a skillet, brown the fish bones and fish head lightly. Transfer them into a stockpot, add enough water to cover the fish bones and head. Add wine and all the vegetables. Season lightly with salt (the stock will reduce so remember this when you add the salt). 2. Bring the stock to boil and then simmer for about 1-2 hours. Strain and the fish stock is ready to use. Freeze any leftover and it should last weeks, or not months. 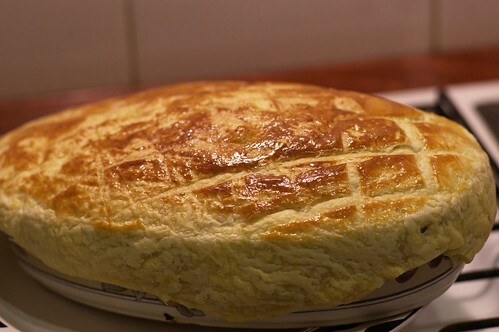 Chicken and Mushroom pie, originally uploaded by yongtze. Strictly speaking this is not a real pie. It is essentially creamy chicken and mushroom in a dish with a puff pastry lid. However, with the buttery puff pastry, it is almost as good as the real thing. Since it is relatively simple and equally delicious as a real pie, it won't be long before I make this again for dinner. 1. Melt butter in a large, heavy-bottomed skillet over high heat. Sear the chicken on both sides until lightly browned (the chicken doesn't have to be fully cooked at this stage). Season with salt and pepper. Do not overcrowd the skillet, cook in batches if required. Remove the chicken once seared and set aside. 2. Add enough oil to the same skillet, reduce the heat to medium, add onion, garlic and mushroom. Cook for about 5 minutes or until the onion has softened and the mushroom is almost cooked. Toss the pan frequently to cook them evenly without burning. Set the mixture aside with chicken. 3. Preheat the oven to 220 degree Celsius. On the same skillet, add a bit more oil if required, add the shallot and lightly fry it for about 30 seconds to 1 minute. Add white wine and cook until the liquid is reduced by half. Add chicken stock or mixture of chicken stock and milk. Bring the liquid to boil. Add chicken, onion, garlic and mushroom back to the skillet. Reduce heat to low and simmer for about 5 minutes, stirring frequently. Check seasoning and add salt and pepper if required. Add the cream and simmer for another 5 minutes or so and turn of the heat. The mixture should not be too watery but with creamy and slightly thick sauce. 4. Invert pie dish on puff pastry and cut the puff pastry around the pie dish. The puff pastry lid should be larger than the top of the pie dish so it can cover the pie dish entirely with the edges folded down the the side of the dish. 5. Pour the chicken and mushroom mixture into a big pie dish or 2 smaller pie dish. Beat the egg yolk, using a pastry brush, brush the egg yolk on the edge of the puff pastry and cover the pie dish with the puff pastry lid. Firmly press edges of pastry against the side of the dish. Brush the top of the puff pastry lid with the egg yolk. Score the top of puff pastry with a sharp knife in a criss-cross pattern. 6. Bake the pie in the oven for about 25 minutes or until the pastry has turned golden brown. Serve hot. I have been baking cupcakes at home last month instead of paying for them at the shops. Cupcakes are quick and fun to make especially if you have a mixer at home. 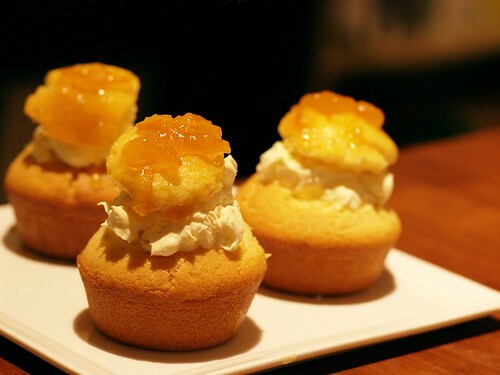 This recipe makes nice buttery cupcakes with orange flavour. Bake a big batch of them then you will have enough desserts to last a whole week (well, almost). 1. Preheat the oven to 200 degree Celsius. Line the muffin pan with cupcake cases (optional, I didn't use them but only buttered the pan lightly to prevent sticking). 2. Beat butter, sugar and vanilla with an electric mixer until light and creamy. Add the orange zests and gradually beat in eggs. Beat thoroughly. 3. Add half the flour and half the milk. Stir slowly by a rubber spatula. Repeat with remaining flour and milk and mix them with the rubber spatula. Then beat with the mixer for just a few seconds to thoroughly combine the ingredients but do not overbeat the mixture. 3. Divide the mixture evenly into the muffin pan. Bake for 15-25 minutes, depending on what size your cupcakes are. The cupcakes are ready when a knife or skewer inserted into the centre of a cake comes out clean. 4. Cool the cakes before cutting and filling. Use a sharp pairing knife, hold it at a downward angle and cut a round cap from the top of each cupcake. 5. Whip the cream with icing sugar until thick. Place some whipped cream in each cake. Spread some marmalade on the round caps before putting them on top of the cream on each cake. 6. Store leftover cakes in airtight container in the fridge. 福建蝦麵 – Hokkien prawn noodle, originally uploaded by yongtze. Good hokkien prawn noodle is hard to come by in Melbourne. So I decided to try cooking it myself last weekend. I found a properly good recipe here but it is a bit too time-consuming so I simplified the recipe but the results were surprisingly good. The secret to making a great prawn noodle soup is in the stock. Here, pork fat, pork belly (or ribs), prawn heads and shells are patiently browned and caramelised before being turned into a rich and well-coloured stock. 1. Heat wok over high heat. Add oil and pork fat cubes. Gently fry the pork fat until it is crisp and brown. The pork fat will release more oil and flavour the oil nicely. Remove, drain well on paper towels, and set aside. Next, with the same oil, turn the heat to medium-low, gently fry the shallots until brown but not burned. Remove, drain well on paper towels, and set aside. 2. With the same wok and oil, turn it up to medium-high, brown the pork on one side. Add dried chillies while browing the pork on another side. Once done, remove and place them in a stock pot. Set aside. 3. With the same wok again, add prawn heads and shells to the wok, frying slowly until shells are caramelised and well-coloured. Remove and add to stock pot. Add 6 cups of water, salt, peppercorns, and star anise to stock pot. Bring to the boil then turn down to a leisurely simmer. Simmer for at least 2 hours or more until stock tastes richly flavoured (you can reduce it further if required). Add palm sugar and soy sauce to taste. Simmer another 30minutes. Strain stock. Keep the pork. Slice or shred the pork for toppings later. 4. Now, poach the prawns in the simmering stock till cooked, about 1-2 minutes. Drain them and set aside. Cut the fresh chillies, place them in a small bowl with some light soy sauce. Cook Hokkien noodles in large pot of boiling water for 1-2 minutes. Drain well. Divide both into two deep bowls. 5. 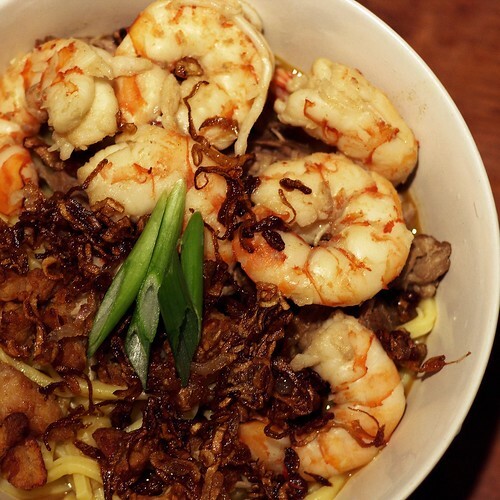 Top the noodles with prawns, sliced/shredded pork, fried shallots, fried pork fat cubes and spring onions. Bring the prawn and pork stock back to the boil. Ladle the stock over each bowl of noodles and serve immediately with the fresh chillies in soy sauce for dipping (optional). It's been a while since I updated this blog. 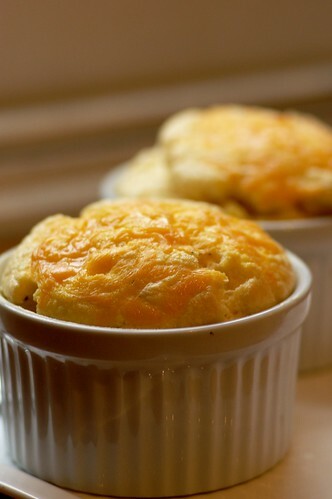 Here is a French classic – Cheese Soufflé. The cheese puff is light-as-air but the cheese cream underneath, however, is as rich as it gets. This is a recipe adapted from Le Cordon Bleu Complete Cooking Techniques. It asks for Gruyère cheese but I substituted it with some British cheese which I believe should be the Red Leicester cheese because I don't have Gruyère and Red Leicester cheese melts really well. 1. Put the egg yolks and wine in a large bowl set over a pan of gently simmering water and whisk them togther until the mixture is pale and thick enough to leave a ribbon trail when lifted. Remove the bowl from the heat and whisk until the mixture is cool. 2. In another bowl, whisk the egg whites until stiff. Fold the whites gently but thoroughly into the egg yolk mixture and season with salt and pepper. 3. Bring the cream to the boil in a pan and stir in two-thirds of the cheese until melted and smooth. Pour into two ramekins. 4. Spoon the egg mixture on top of the cheese cream, filling almost to top. Run a finger around the the inside of the rim to push the mixture away from the edge. Sprinke each with the rest of the cheese. Flambéeing crêpes suzette, originally uploaded by yongtze. 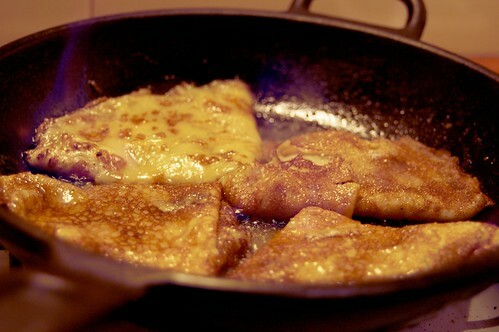 Crêpes Suzette is a typical French dessert but I haven't seen it in any restaurant that I have been to. This is a recipe from Julia Child's Mastering the Art of French Cooking. I really like the intense orange flavour of it. If you prepare the crêpes and the orange butter ahead, it is easy and fast to finish this classic dessert. Practise the folding and flaming of the crêpes until you become good at it had you wished to perform this dish in public. 1. Place the ingredients in the blender jar in the order in which they are listed. Cover and blend at top speed until well mixed and the batter is smooth. Cover and refrigerate for at least 2 hours. 2. Brush the skillet with oil. Heat the pan over moderately high heat until it begins to smoke. Immediately remove from heat, pour in a 1/4 cup of batter into the middle of the pan. Quickly tilt the pan in all direction to run the batter all over the bottom of the pan in a thin film. 3. Return the pan to heat for 20-30 seconds. Once the under side in a nice light brown, turn the crêpe and brown lightly for about 15-20 seconds on the other side. As doen, slide the crêpe onto a wire rack and let cool several minutes before stacking them on a plate. Grease the skillet again and proceed with the rest of the crêpes. You can keep the crêpes warm by covering them with a dish and seeting them over simmering water. Crêpes also freeze perfectly. 1. Peel the skin of the orange (only the orange part) and place them together with the sugar in a food processor. Process until the orange zest and sugar are finely blended. Cut the butter into small pieces, and add into the processor and process until smooth and almost fluffy. 2. Then, cream in the orange juice and the orange liqueur by droplets. Add a bit more orange juice if the muxture still remain creamy. Cover and refrigerate. 1. Place the orange butter in a large skillet set over low-moderate heat (or you can use a chafing dish set over an alcohol flame shoud you wish to perform this in public). Heat the butter until it is bubbling. 2. Dip both sides of a crêpe in the butter. Fold it in half and in half again, to form a wedge. Place it at the edge of the pan. Rapidly continue with the rest of the crêpes until all have been dipped, folded and arranged. 3. Sprinkle the crêpes with the sugar. Pour over them the orange liqueur and cognac. Avert your face and ignite the liqueur with a lighted match or a lighter. Shake the pan gently back and forth while spooning the flaming liqueur over the crêpes until the fire dies down. Serve.